Well, I suppose this was bound to happen. I got the idea in my head back when I posted my vegan chicken Parmesan a few months ago. I even saw a few people commenting on social media that the recipe would be perfect for making vegan chicken nuggets. And so, here I am, with a recipe! But I added a little something to this recipe. I didn’t exactly follow the vegan chicken Parm recipe. In fact, this is a bit of a hybrid between that recipe and my artichoke burgers from last year. Artichokes are pretty meaty, so I thought they’d be perfect. One thing about these nuggets: they’re fried. Not deep fried, but shallow-fried. 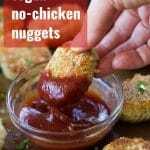 So really, if you ever buy frozen vegan chicken nuggets, these are probably no heavier on oil than those, but at least you’re familiar with everything that goes into these! I feel like I have to mention the whole fried thing because when I post a recipe like this I can be sure somebody will ask if they can be baked. The answer, in this case is yes, but they won’t be as good. I tried a baked version a month or so ago and ended up scrapping it because those nuggets were just okay. If you’d prefer to bake them, do so at your own risk (and at a time and temperature of your own choosing, because like I said, I didn’t like mine so you probably don’t want to use my instructions for the baked version). Don’t overblend your ingredients in the food processor. The mixture will get mushy very quickly, and nobody likes a mushy nugget! 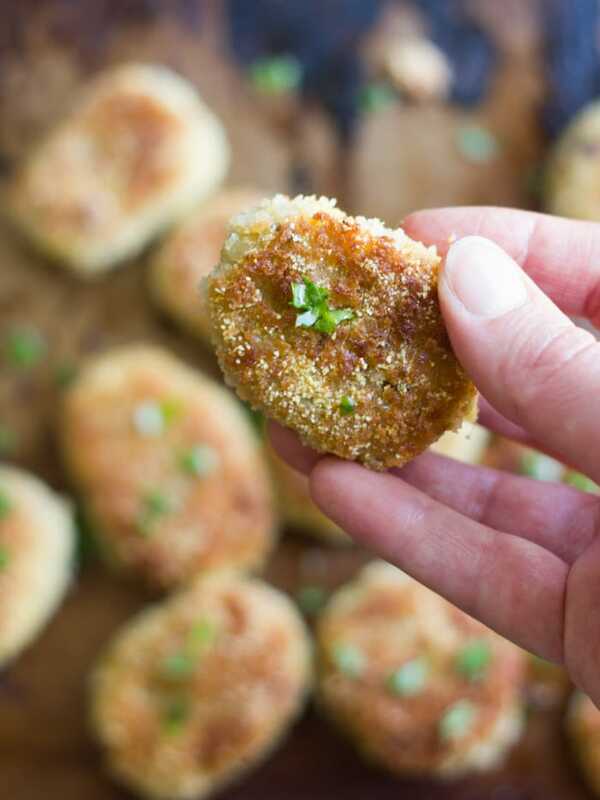 Make ahead option: the nugget base (meaning the chickpea and artichoke mixture that gets mixed up in the food processor) can be made up to a day in advance and refrigerated. The seasonings in these are very mild. I wanted them to be super kid-friendly! Feel free to add extra garlic, onion powder, paprika, chili powder, or your favorite seasonings! Can these be made gluten-free? Maybe, but I haven’t tested a gluten-free version. 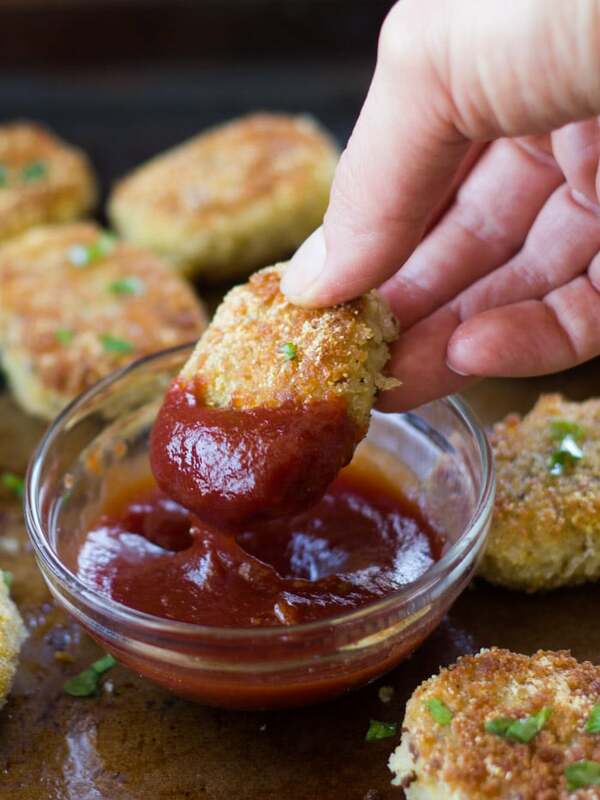 My recommendation would be to thicken the batter with a gluten-free flour, such as chickpea, and use gluten-free panko breadcrumbs for the nuggets and coating. Can these be baked? Can they be air-fried? They can be baked, but I don’t recommend it, and I can’t give an exact bake time and temperature (I didn’t record them because I didn’t like the baked version). I don’t have an air-fryer, so I’m not sure if that would work! 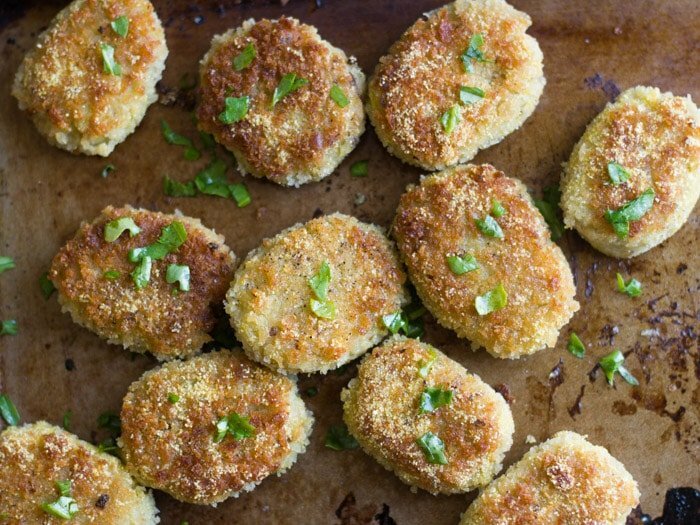 Chickpeas and artichoke hearts are shaped into nuggets, coated in a mixture of panko breadcrumbs and cornmeal, and pan-fried up until golden to create these crispy, delicious and satisfying vegan chicken nuggets. Place artichoke hearts into food processor bowl and pulse until coarsely chopped. Add remaining nugget ingredients and pulse again until chickpeas are finely chopped and ingredients are well blended, being careful not to overdo it or the mixture will get mushy. Season with salt and pepper to taste and transfer to a container with a lid. Refrigerate at least 30 minutes (or up to a day). Stir batter ingredients together in a small bowl and allow to sit for at least 5 minutes. While the batter sits, stir coating ingredients together in a separate bowl. Season with pepper to taste, and add some extra salt if you like. 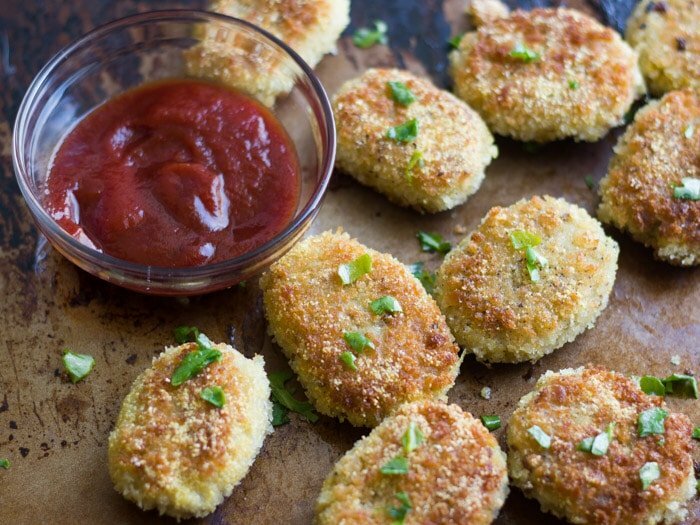 Remove mixture from refrigerator and shape into 20-24 nuggets. Coat the bottom of a large flat-bottomed skillet with oil, at least 1/8 inch deep. Place over medium heat. Dip a nugget into batter and gently flip to coat both sides. Transfer to coating mixture and coat both sides. When oil is hot, transfer nugget to oil. Repeat for as many nuggets as you can fit into the skillet, cooking about 4 minutes, until browned on bottoms. Flip and cook until browned on opposite sides. Transfer to a paper-towel lined plate. Repeat until all nuggets are cooked, adding oil to the skillet as needed between batches. Oo! I’d never thought of using artichoke hearts for something like this. Awesome idea! Looks delish! Could hearts of palms for the artichoke? Ahhhh these look so fantastic!!!! What a brilliant idea!!!! I buy the Quorn nuggets all the time and love them!!! I may have to give these a go! These are amazing! We LOVED them! Have you tried baking them?? Would love to cut down on the oil and not have to fry. These look awesome! Just a warning though, olive oil actually has a low smoke point and is a carcinogen when you fry it! Have you tried baking them?? I’m not a fan of frying thing. I have, and they were okay, but I wasn’t really happy with the texture. You could maybe give it a go, but spray or brush them with a bit of oil if that works with your diet. What about using an air fryer? Any idea how long to cook in one of those? I’m afriad I don’t have an air fryer, so I’m not sure! I’ve heard from some readers that made these in the air fryer with success, but nobody mentioned how long. They’re packed in water. We have the marinated ones here in the US and they’re different – usually packed in oil with a bunch of seasonings. You might be able to get them to work if you tinker a bit with the recipe and seasonings, or even try rinsing them in water. You could also look around for frozen artichoke hearts or order canned online. Good luck and I hope you can give these a try! You know what I use hearts of palm and they are delish! You can make vegan-crabless-cakes or vegan chickless fried sandwiches. I figured artichokes would work as well but never tried it so thank you for this recipe. Have you tried freezing these to use at a later time? I wondered if it would work since you don’t bake them, but it would be so convenient to make a ton in advance and save for future uses! I haven’t, but I think it might work. What I often do with veggie burgers is mix everything up and freeze it, then shape pan-fry later. I bet you could get away with something similar here, but you’d also have to batter and coat them after thawing. Just made these and they were delicious! I pan-fried but since they were still soft inside, I toasted them in the toaster oven for a few minutes. Also, I didn’t have flaxseed so I just used more panko bread crumbs (the coating turned out perfect). Thanks for the great recipe. Glad you enjoyed them! Thanks Tatiana! Have anyone tried to make these gluten free? I know I can use gf bread crumbs. Just wondering if I should try corn flour for the batter or rice flour OR a gf flour mix. It might be possible to be able to air fry them! Can you use apple cider vinegar instead of red wine vinegar? I think so. The flavor might be a bit different though. I made these for a family dinner last night and we had the leftovers for lunch today! These are amazing, the fry up perfectly, have great texture, and are delicious. I’ll defiantly be making them again! I’m so glad they were a hit! Thanks so much Juliann!! This is the first recipe I cooked in my new Phillips Air fryer. It was a game changer! Crispy on the outside, fluffy on the inside. An awesome recipe! Thank you so much. Can I sub the corn flour for almond flour? I think that would work, but I haven’t tried it myself so I can’t be totally sure. Want to try recipe but was wondering, if I baked what temp and how long? I didn’t keep my notes on the baked version because I wasn’t super fond of it, but I’d guess at 400 degrees and say check them every few minutes after the first 10.
oh girl!! you recipes are awesome. I am following your recipes from a month and my family loved every dish which i cooked. I’m so happy to hear that!! Thanks so much for letting me know! Yay! I’m glad you’re enjoying them!! What is the serving size? All your recipes say serving size but don’t say what the size is. Is the label for the whole batch? 16g protein is whole batch? I’m not sure! Chickpea flour might work, but I can’t say for sure without trying it myself. Amen. Just because you don’t want it to be meat doesn’t mean you can’t get behind fried. I made these for my kids and ended up eating half of the batch by myself. They loved them too! Great recipe!